The Flint Citadel Band (Bandmaster Matthew Rowland) was happy to welcome home Bandmaster William Himes for their season-opening rehearsal. Joining Bandmaster Himes on trombone was his brother, David Himes. Between the band and songster rehearsals, all six of the Himes siblings were together in the same place once more. 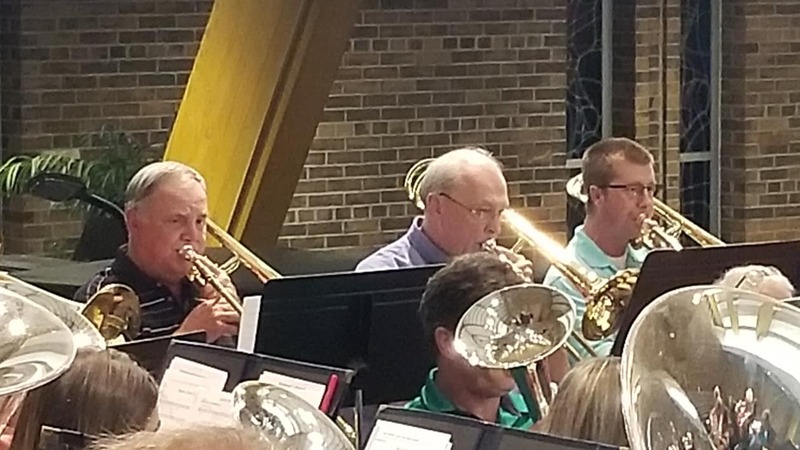 The rehearsal opened with Bandmaster Himes’ arrangement A Quiet Moment, which was written to commemorate the 90th birthday of Dr. Ray Everitt, former solo cornet with the Port Huron Citadel Band. Himes has noted that Dr. Everitt is one of his personal heroes. This article was posted in News and tagged David Himes, Flint Citadel Band, Matthew Rowland, Ray Everitt, rehearsal, William Himes on 21 September 2018 .